Chic villa on Private lagoon, Pool Privileges, Great location and Discount! Guests love our West Beach location and it is getting even better. The Resort has redone the Cougar Point golf course and clubhouse. They are presently building a new conference center. Although the construction is down the road from us and you can not see it, you may hear some noise if you are outside the building. It does not affect access to/from the condo nor access to the trails or beach. Construction began in August, 2018 and we have consistently rented since then with no complaints from our guests. So come and feel free to enjoy this wonderful island through us. Tastefully decorated with your comfort in mind, nothing was overlooked. From the comfy king-size bed to the washer and dryer, wireless internet service to the fully-equipped granite topped kitchen, our sophisticated villa has all the amenities a discriminating vacationer considers. Our location is the best on the island! Only 150 yards from the beach, you can easily walk to the newly renovated Cougar Point golf course and the new West beach pool complex. It gets even better! Our villa is surrounded by a private, pristine lagoon where you can sit privately on the back porch and watch the parade of wildlife right in your own back yard! This is a smoke free, pet free villa for your enjoyment. We'd love to have you. Guests remark at how particularly welcoming and convenient our beach villa is. The bedroom boasts a comfortable, king-size bed, color TV with remote and walk-in closet with ironing board and iron. The bathroom has a walk-in shower, linens and hair dryer. Our relaxing living room includes a sofa sleeper and entertainment center with 100+ chanel color TV and DVD. 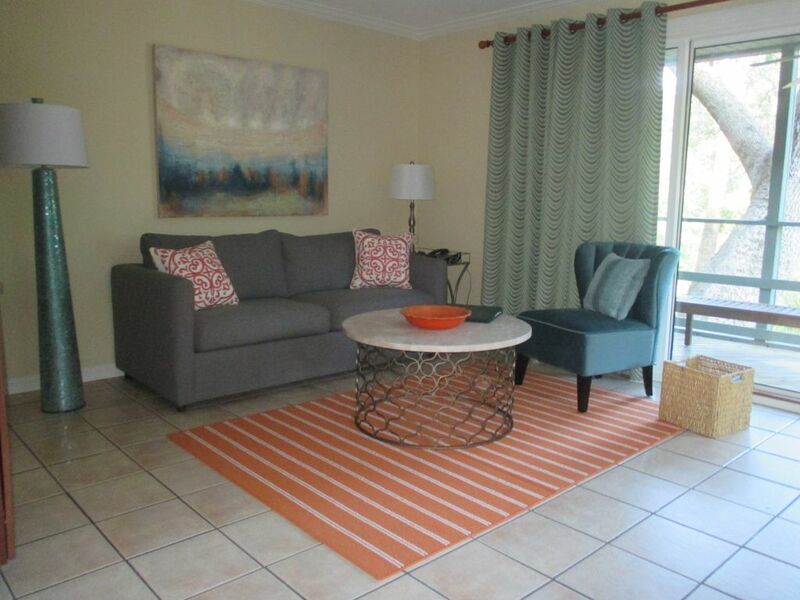 Just off the living room, for your pleasure, is a furnished, screened-in porch with closet washer & dryer. Fully appointed, the kitchen includes a full-size refrigerator, stove, oven, microwave, and dishwasher. So come, we'd love to have you. Activities: Rent through us and use your resort privileges for pool, work out center and Island activities. You can choose to enjoy the 10 miles of clean, pristine beach so firm you can ride your bike on it. Besides the world-class tennis facility and 5 championship golf courses, the Island features over 30 miles of paved bike path that winds throughout the Island. Night Heron Park offers basketball courts, soccer fields and picnic area as well as a nature center where you can arrange to rent canoes and kayaks. In the summer the park offers activities such as Kamp Kiawah for kids, poolside trivia, ice cream socials, summerfests, cookouts and weekly entertainment. Nearby Seabrook Island offers charter fishing, boat rentals and horseback riding. Area Attractions: Charleston area attractions are limitless and include city, plantation, bay, Civil War, home and garden tours. History abounds whether you're observing the antabellum houses, visiting the maritime museum or shopping for antiques. For the thoroughly modern, there are malls and upscale, down-town shopping, the IMX theatre and art galleries. For the naturalist, Angel Oak and the bird sanctuary island are a must see. If you didn't get enough golf on the island, there are lots of public courses in the area. Believe me, you'll plan on staying an extra week next year. Conscientious homeowners who are blessed to own on Kiawah Island and love the share the unique Kiawah experience with others. We fell in love with Kiawah Island while staying in a friend’s villa. We'd never experienced anything like it - and we didn't want it to end. So we bought! Now we get to share this awesome experience with others. We bought this villa particularly for the VIEW and LOCATION. We looked at a lot of villas, but this is the only one surrounded by a private lagoon. The awesome view and nearness to the ocean, golf and shops won us over. Renting through us also entitles you to Resort Privileges, i.e. use the Kiawah Island pools, work-out center, discounted golf, tennis and recreation, free shuttle service around the island, and charging privileges. About 150 yards from the ocean. Renters have full Kiawah Island Resort privileges, i.e. discounted golf, tennis and recreation, free shuttle service around the island, and concierge services. A two minute walk to the Straw Market. There you will find a casual restaurant, ice cream store, internet cafe, visitor ship and work out center. In house. You can make long distance calls but the cost is outrageous. Bath towels are provided in the villa. You can get beach towels at the pools. You have access to the heated Night Heron Pool, the West beach pool and the adult only Tennis Club pool. Workout Center available to our guests. Smoke free and Pet free. You may never want to leave the island! But should you decide to go exploring for a day, we recommend historic Charleston, just 26 miles north. An attraction for Civil war buffs, antebellum enthusiasts, avid gardeners and plantation perusers, Charleston boasts something for everyone to do. Looking for all-scale shopping, a plethora of restaurants, antiques or art? Downtown is the place to go. It has theatre, museums, IMX cinema, aquarium, and tons more stuff that we haven't even explored yet. The surrounding area offers bird sanctuaries, Civil war forts, parks, golf courses and more.